From the planning phase to execution, our Banquet Coordinator will help you host a fabulous event. 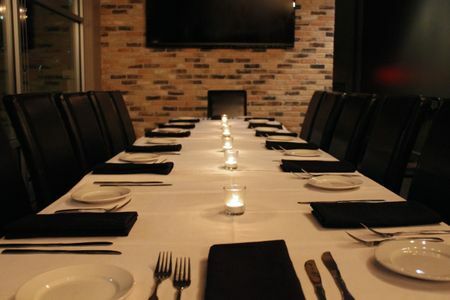 Our Downtown Party Room features floor-to-ceiling windows, butcher-block table tops and comfortable leather chairs. This elegant space will accommodate up to 32 guests for your cocktail reception, buffet lunch or family-style dinner party. 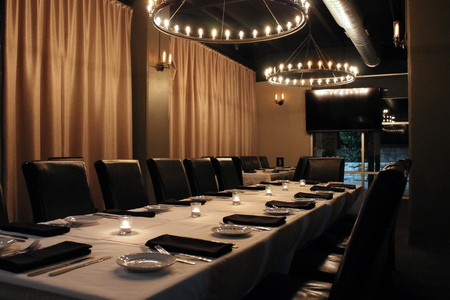 The Party Room includes two 80" flat screens to keep you and your guests tuned into your presentation or the big game! For larger parties (up to 60 guests), our Downtown Party Room paired with East Cocktail provides the perfect VIP space for guests to move about and mingle while sipping on cocktails and enjoying your favorite Cover 3 appetizers. Our Patio is sure to be your favorite downtown venue for outdoor dining, celebratory weekend brunch or evening cocktail party. The space has heaters for cooler weather and portable coolers for Austin's summer months, making it well equipped to keep you comfortable for parties throughout the year. The entire patio will accommodate up to 68 guests. Cover 3 Downtown offers complimentary garage parking and is a convenient location to gather friends, clients and family. There is not a flat fee for the space however we require a food and beverage minimum. All food and beverage purchased from your event space will go toward meeting the minimum. Food and beverage minimums vary by specific date and timeframe. For details and availability please contact your Banquet Coordinator, Misti. COVER 3 is an awesome venue for corporate events and fundraisers. Accommodating up to 300 people, we host an amazing private party that is certain to provide a memorable experience for all!